Planet Aid provides educational experience for local school children - Planet Aid, Inc. 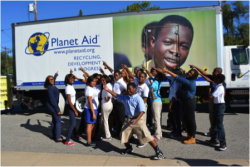 This past September, with the assistance of Councilman Terrell Pruitt, the Whitney M. Young School partnered with Planet Aid for a fundraising event. Principle Karen Byron-Johnson, with all the teacher, children, and their families brought bags of clothes and shoes to the school. Not only was money raised for the school, but it was an educational opportunity for the children. The children "dropped" off their bags, simultaneously learning about the importance of recycling and environmental impacts. The clothing drive was successful with 3680 pounds of clothing and shoes diverted from landfills.